The latest Scottish Chambers of Commerce’s Quarterly Economic Indicator survey showed Scottish firms continuing to display resilience amid economic uncertainty — and found growing optimism within manufacturing and financial & business services firms. However, the survey, produced by the Scottish Chambers of Commerce Network in collaboration with the University of Strathclyde’s Fraser of Allander Institute, found concerns about investment levels and serious recruitment challenges. The retail sector displayed some evidence of an encouraging fourth quarter, with key financial indicators such as sales and cash flow reported as improved over the third quarter of 2017. Professor Graeme Roy of the Fraser of Allander Institute said: “With heightened levels of uncertainty, it is unsurprising that investment intentions remain modest, whilst the tight labour market means that many firms continue to report difficulties in recruiting staff. 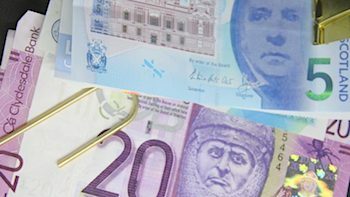 Neil Amner of Anderson Strathern, Chair of the Scottish Chambers of Commerce Economic Advisory Group, said: “The results of the fourth quarter Quarterly Economic Indicator are broadly positive, and suggest that Scottish businesses are continuing to display positivity in an uncertain economic environment. “Many sectors are continuing to invest in training in an attempt to retain and upskill their existing staff, but it is clear that businesses are finding it challenging to fill vacancies.